Introducing the most flexible season ticket for USF Football fans. The all-mobile Horns Up Pass gets you access to every 2019 regular season home game at Raymond James and includes exclusive ticket management features. WHAT MAKES THE HORNS UP PASS VALUABLE? Can't make the game? With the Return Tickets feature, you can return tickets and instantly earn credit to be applied towards Guest Tickets and Seat Upgrades. Your seats will vary game to game, and tickets are conveniently delivered to your phone via text message prior to each game. Manage tickets on your phone and scan into the venue with a few quick taps! With the Sit With Friends feature, link your ticket(s) with other Pass purchasers to be seated together, or Buy Guest Tickets to bring a friend and sit together..
Tickets are easily transferred to your guests. Your seats will vary game to game within the Club section, including 109-112, 135-136, 208-213 and 237-234. Club seats include exclusive access to premium food and drinks including local favorites and craft brews. Your seats will vary game to game on the Sideline within sections 107-108, 113-115, 132-134, 137-139, 206-207, 214-215, 231-233, and 238-240. 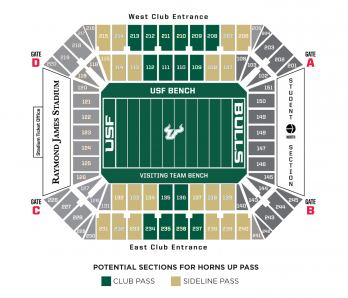 Tap the Raymond James seating chart below to view potential sections for each Horns Up Pass option. Before you receive your tickets, utilize Ticket Management features to purchase guest tickets, sit with friends, and more! Accept your tickets when available, and scan into the venue with your mobile barcodes! Which games are included with my Horns Up Pass? The Horns Up Pass includes tickets to every 2019 regular season home game. Am I guaranteed seats for every game? Yes, you are guaranteed a seat for every home game. Your seat location will vary from game to game within the sections designated by your Pass purchase. Seats will be delivered at the time noted in the Ticket Management view. You may purchase up to eight (8) passes, while supplies last. All Passes purchased in one transaction will have seats together for each game. How do other fans in my group scan into the event? Other fans in your group can enter the venue with you using the barcodes on your phone, or you can send your guest their own barcode. After accepting your ticket, simply tap the Transfer button located in the Ticket Management view and enter your guest's email address. Can I sit with other Pass Purchasers? Yes, if you would like to sit with other Pass purchasers, you may link your Pass by tapping Sit With Friends in the Ticket Management view prior to the noted time. What if I lose the text message that tells me to accept my seats? If you can't access your Pass via text message, simply go to USFpass.com and login to view your tickets. Your seat location will vary by game. Please note that the time you accept your tickets does not impact which seat location you're assigned. Can I purchase guest tickets for certain games, in addition to the Pass tickets I already have? Yes, you may purchase guest tickets for certain games based on availability. To purchase, simply tap Buy Guest Tickets in the Ticket Management view and complete the transaction prior to the note time. All tickets will be seated together, and pricing may change from game to game. Will I be notified when my tickets are available for each game? Yes! When you register your Pass, you will be asked to enter your email address and phone number. Respond "yes" to the text message from 986-96 to opt-in for text message reminders. Can I return my ticket(s) for games I can't attend? Yes! If you are unable to attend an event, you may return your ticket(s) for credit by tapping Return Tickets in the Ticket Management view prior to the noted time.